I have just bought Light Room3 (v3.5) on Dell Latitude E6520 with an Intel Core i7-2720QM processor, 8GB RAM and a 256GB SSD. I store my photos on a RAID5 NAS. When using the spot removal on .jpg files (so far it has not happened on raw - Nikon D7000 16MP .nef files) if use the tool more than twice in a row, LR freezes - the little hand makes a fist, processor works, memory used increases - looks like program is in a never ending loop). If I stop the program and re-start, the change is there. I notice on the web that this has been a problem for over a year but I cannot find a sensible fix. (There are many suggestions about bad drivers, bad power supplies etc.) Is there a fix? if so, what is it and where do I get it? Doesn't happen on LR2, but I'm not sure about earlier LR3 versions as I haven't had time to go back and test. Thankyou - it's good to know that I'm not alone. One thing for me try would be to re-install without adding the updates. Is it possible the graphics drivers need updating? What video card are you using? Do you have more than one monitor set up? What's the resolution of the monitor you are using? I'd go directly to the nVidia or AMD/ATI site to make sure you have the latest drivers. I'm using two monitors - both are full HD (1920 * 1080) with an nVidia card (sorry not at home so don't know the exact version). My feeling is that it's not this as I updated all drivers about 2 months ago - I only have LR3 a couple of weeks. Nothing else freezes when this happens, any other program running works normally and I can see the memory in use by LR3 increasing. Its possible my comment above only demonstrates my ignorance of how LR3 works. I'll try this and the other possible solutions tonight. Thanks for the reply, I'll keep you posted.. Same exact scenario to George, very similar hardware, monitors, nVidia GTX 560 Ti, brand new and updated. 16 GB of RAM, AMD FX(tm)-6100 Six-Core processor, SSD drive for OS and 2TB hard disk for media. This occurred on our last machine as well, which wasn't quite as powerful. I have noticed that it is more frequent when working on files that I had edited in photoshop and then saved as psd. Also tried operating the catalog on both drives, SSD and hard disk, no change. IMHO, there is definitely a problem in LR 3.5 cloning in 1:1 zoom level related to JPEG images and multicore processors. and they both show the hangs (freezes) in spot removal when done in a 1:1 zoom level. Dedicating LR to run on one core only makes the problem disappear on both systems. Please see also this thread over at the U2U forum which discusses the same subject. This is a sample image on which the problem occurs quite heavily. I don't know what kind of JPEGs show the problem the most, I've noticed that pixel dimensions have an influence (very small JPEGs seem not to show the problem). P.S: If you need any instructions on how to reproduce the problem, please ask. The original post in the thread Jim mentions describes it pretty well though. Hi Beat, many thanks, I'll try this tonight along with Jeffrey's suggestion. I'd be interested in hearing your results. Thanks guys. Appreciate the additional details - just want to make sure we've debugged all possible culprits - and have a complete picture with which to have someone on the QE team try and reproduce. If you give me an e-mail address or access to an ftp server, I can let you have a copy of the image and detailed instructions on how I get it to freeze. I started testing (with LR3 allowed to run on all cores) a raw (.nef) photo with dimensions 4928*3264pixels. I sarted testing by doing 5 spot removals, each followed immediately with a spot update. I did it at 1:1, 4:1 and 11:1 zoom. I had no problems. I then started 'playing' with 'processor affinity'. I had no problems with any of the above when running on 1 core (CPU0). At 7 CPUs I had less trouble than with 8, and with 6 CPUs less trouble than with 7. I noticed when LR froze, one core was always working harder that the others. If I unselected that core, 9 out of 10 times LR 'unfroze' as I pressed the OK button in the 'Processor Affinity' pane. My first thought was there was probably some sort of race condition with one thread looping (not always flat out - the hardest working thread I saw was about 80-85% and it 'grew' to this level over a couple of seconds.) possibly waiting for another thread to finish but would stopping the looping thread before it finished allow other threads to continue? Thanks for your findings, George, which match what I experience, although I did not go that far with testing. George and Beat, does the bug still happen for you with Lightroom 3.6 (now available on adobe.com)? I tried clone spot removal with Beat's sample image, zoomed to 1:1, and added over 30 spots without any problems. This is the same problem you and I discussed directly when V 3.0 was released. With each passing update I hoped, as did you, it has been resolved but through 3.5 no solution seen yet. There was some improvement around 3.2 or 3.3, I don't remember, but it is still there. It seems fairly certain to be a core resourcing problem. I have turned hyper-threading off and the problem/lag is significantly better (as other have suggested) and it is clearly worse on JPEG images (again, nothing new being reported). When I do still see the spot-healing hang, or if I visit an image in the Develop Module which had a significant number of spots previously applied, I view the "CPU Usage" gadget I have running and always when this hang occurs, one core (random) is always at 100% and feels "stuck". As soon as it drops down below 100%, all goes back to normal. I haven't loaded 3.6 as there was no indication that this issue was worked on since 3.5 thus I saw no need. Others don't seem to see any improvement either so I assume it is still the same old issue. 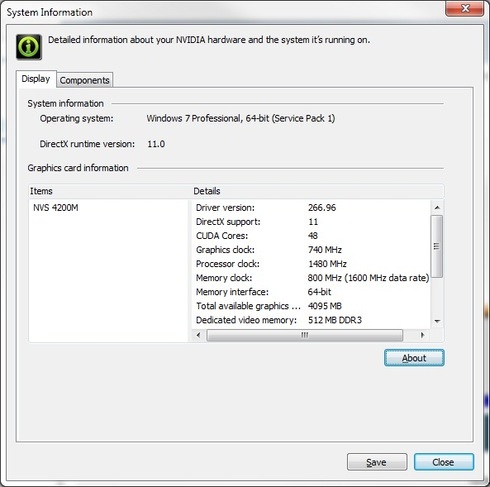 I have tried both Nvidia and Ati cards and updated software but the problem persists. and always when this hang occurs, one core (random) is always at 100% and feels "stuck"
This is not what I (and others who have tested) see during the lockup. This is a snapshot of my CPU usage during such a lockup, note that the hang was resolved where you see the sharp decline in CPU usage on several cores. Beat - and that is probably why this problem has persisted so long, it can't be consistently described or duplicated between machines. Do you have the i-5/7 cores or the Xeon series? I have the Xeon E5520 2.27GHz processors (2). This screenshot (from above) was taken on a i7 980X with Hyperthreading enabled. But I also see similar behaviour on my notebook with an i7 2620M with Hyperthreading enabled (see here). Disabling Hyperthreading seems to cure the problem on my i7 2620M (2 cores left), but not on my 980X (6 cores left), as this screenshot shows. Note that when Hyperthreading is off, one core is close to (but not AT) 100% during the lockup period. I haven't installed 3.6 yet, I'll test and report back after the week end. I've just installed 3.6 and retested using Beat's jpeg, but still getting the same inconsistent results. First test: made two clone spot removal attempts (each case rather extreme long distance clones), got the closed-fist lockup on the second one and this did not clear so had to force quit using Task Manager. Second Test went better, was able to apply copious spot removals but did not attempt to update the sampling spot from the LR selection. After 20-30 of these I then started adjusting the sampling area and got the 'temporary for a few seconds' closed fist. Slow and jerky, but could survive. Third Test, repeated the second test, but this time after successfully applying spot removals using default sampling area, then got the full closed fist lockup when attempting long distance clones which did not recover. Force quit required. Fourth Test: tried to repeat the first test, and on the very first attempt the cursor/fist simply disappeared (the cursor reappears when I move outside the Lightroom window).and still hasn't reappeared within Lightroom while I was typing this note. Another force quit required. So basically no change at all from 3.5. Question: was there a specific fix applied in 3.6 for this bug? Same here. I just installed LR 3.6 on my notebook (dual-core i7 2620M 2.7GHz processor with HyperThreading), Intel and NVIDIA video controller) and get the same (inconsistent, but repeating) results as in 3.5. This does not happen if I confine LR to Core0. Please note the HyperThreading in effect for both cores. If I can assist with having debug traps in place, I'd be happy to test for you with your instructions. Just to add that after waiting in vain for over 10 minutes for my cursor to come back inside Lightroom, I used the Task Manager to assign affinity to one core only and got immediate recovery of the cursor AND the ability to rapidly and smoothly add many more long-distance spot removals. BTW, I did not have to be zoomed into 1:1 for any of the above problems....they happen just the same in Fit view. George, I think you'll find that it doesn't really matter which single core you assign affinity to, it's just the fact that a single core is assigned which causes LR to 'unlock'. I've assigned both inactive and active cores with the same result. Hi Jim, I think you misunderstood. If LR is assigned to multiple cores and 'lock's up', by looking at the core activity under Performance and un-assigning the core which is busiest, 9 times out of 10 LR unlocks at the point you hit the OK button. Oddly stopping the core seems to have no detrimental affect on LR which continues as normal, and displays the change being made at the time of the 'lock-up' as being completed. I would tentatively interpret this as one thread being stuck in a loop waiting for 'something' to signal completion when in fact the 'something' has already completed but the looping thread is not recognising this and is in turn holding up the completion of another process/thread. I suspect this condition depends on the timing between two threads which is why it happens so illogically in one machine with a specific photo but not on another, This is just a guess but if correct means that adding debug code will probably stop the lock-up from happening on the same machine under the same conditions. It is not easy to find. I have seen times when LR is locks up for 10 or 15 secs and then reverts to normal behaviour - in this case if the task manager is open you can see the usage on one core drop from about 85% to a normal 0-1% at the point that LR unlocks. OK, yes I see what you are saying.....except that (certainly in my case) when it "locks up" there are usually 3 or 4 cores which are 'busy', so pinpointing the 'one' to clear the hang becomes a matter of trial and error. In my case it is far simpler to simply reassign to a single core just to clear the problem. I would agree with you about the inconsistencies but think I am more impatient than you - if it freezes for more than about 30 seconds, I'm too impatient to wait - so I don't know about it recovering after a few minutes. I notices in LR3.6 it was more likely to recover (within my limited attention span) than with 3.5.1. In a real-life situation I also would be far more impatient, I've let it 'hang' for minutes at a time only as part of a targeted testing effort in order to provide as much information as possible to the Adobe engineers and the folks over at Lightroom Forums. Disable hyperthreading and the problem does not occur, or at least not as often. With only one core assigned forcibly to LR process the problem never occurs. Given the number of people who are suffering from this problem and who have complained about it on other fora, I'm surprised that the little counter at the top of this thread still says '2 people have this problem'. I have worked in the IT business for the last 23 years and I know how difficult it is to find something like this (not that problems like this could exist in PCs 23 years ago) but I also know that if only a small number of people complain about it, then it may never get to the top of the pile to be looked at. Hi Beat, Do you know how to add a comment to the above thread - I can find no way to do it. Do you need to log in a second time for a button to apear or something? You need to sign in using the "Login/Register" link right underneath the large title 'Forums". I am having the same problem myself. The problem has been described well enough here and elsewhere, so not going to bother repeating everything, lest just add that I too am suffering from this bug, and hope Adobe can fix it ASAP. As an experiment over new year I installed LR3.6 onto my wife's computer - same make/model as my own but more modern - and had exactly the same hanging problem with spot removal. Sorry to be late to this party, but I have struggled with this problem for a several months. For me, it happens with 16-bit tiff files created by LR 3.6, externally edited (Ctrl+E) in PS CS5, and automatically added to the catalog by LR after editing. Don't recall if it happens with raw (CR2) files or not. Camera is Canon 5D2. Hardware Abstraction Layer: Version = "6.1.7601.17514"
LR 3.6 Spot Removal Tool hangs the program. But of course you already know this. It's been a problem for at least 1 1/2 years - based on forum comments. Anyway, please fix at least by LR4 release. Lightroom 3.6: Spot Remvoal Tool hangs application.